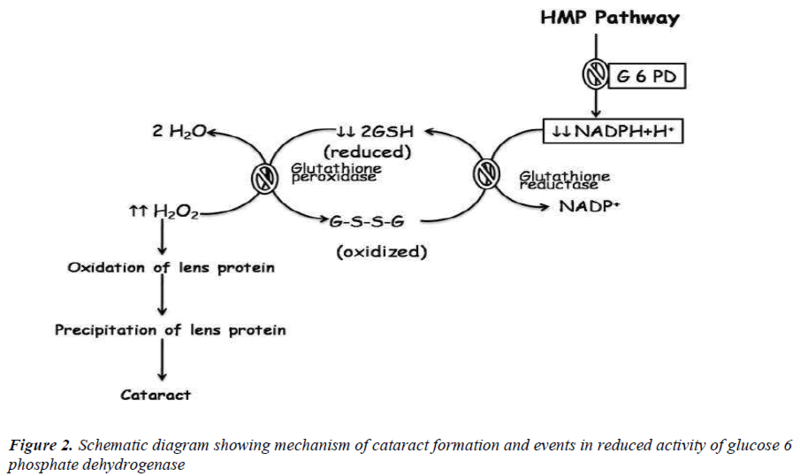 Role of Glucose 6 Phosphate Dehydrogenase (G6PD) in the Pathophysiology of Cataract. Any alteration in the optical homogeneity of the lens or decrease in its transparency is known as cataract. Glucose 6 phosphate dehydrogenase (G6PD) activity was measured in both erythrocytes and lenses of study groups and control groups. The decreased activity of G6PD was observed in the study group subjects both in erythrocytes and lenses when compared with controls. These results showed that the patients with lower G6PD activity are more prone to the development of cataract. Cataract is the clouding or opacity that develops in the lens of eye . It is the most significant and current problem leading visual disability and blindness throughout the world . Cataract develops later in the life and is the consequence of accumulated damage to the long lived lens proteins . The health of the lens depends greatly on the production of reducing power which helps to keep the proteins in their reduced state . The key regulatory enzyme in Hexose Monophosphate Pathway (HMP) is glucose 6 phosphate dehydrogenase (G 6 PD). The primary function of the HMP is to generate reducing power in the cytoplasm in the form of reduced nicotinamide adenine dineucleotide phosphate (NADPH). NADPH is require to keep the glutathione in the reduced form (GSH), which maintains cell membrane proteins in stable reduced form  (fig-1). Thus decrease in the activity of this enzyme could lead to instability of the tissues that depends on a continuous supply of NADPH. Primary amongst these tissues are erythrocytes, but it is also present in other tissues such as the lens, kidneys, adrenals, liver and platelets . Figure 1: Diagram showing function of NADPH detoxification of H2O2. It has been reported that persons with G6PD deficiency are at risk for developing cataract at the same time uncontrolled diabetics are at a higher risk [5,6]. The enzyme aldose reductase which produces intermediate sorbitol is a NADPH requiring enzyme with a high Km for glucose , thus elevated intracellular glucose concentrations and an adequate supply of NADPH leads to a significant increase in the amount of sorbitol. Sorbitol, unlike glucose, cannot pass efficiently through cell membranes and therefore remains trapped inside the cells, increasing osmolality, resulting in swollen cells due to water retention. This pathological alteration (opacity) in the lens tissue leads to cataract formation. Therefore, diabetics with reduced G6PD levels are at greater risk for developing cataracts than diabetics with normal G6PD levels . Although cataract extraction and intraocular lens implantation have been very successful, medicines to cure senile cataract, to prevent or slow down its progress it remains an important research goal for the Ophthalmologist because of the limitation of the cure rate and comparatively high expense of those operations . Present study was undertaken to evaluate the activity of glucose- 6-phosphate dehydrogenase (G6PD) in different types of cataract in order to discover whether there is any association between G6PD deficiency and cataractogenesis. The study was conducted in Solapur (Maharashtra, INDIA) on the lens and sera of 120 individuals between age group of 50 to 80 years who were distributed in two groups viz. study group and control subjects. Study group includes 90 cataract patients. This study group was further divided in nuclear, cortical and diabetic cataract of 30 patients each. Control group comprised of 30 persons with visual activity of 6/6 or better in both the eyes and to whom antioxidant medicines were not given. They were all healthy individuals without any systemic diseases and without any habits like smoking, alcoholism, etc. Patients with ocular surgery, trauma, infection, inflammation of the eye were also excluded from the study. Written informed consent was obtained from all subjects at the time of recruitment into the study. Institutional ethical committee approval was taken for the present study. The cataractous lenses were removed surgically by PECCE+IOL (Planned extra capsular cataract extraction+ intraocular lens) technique. The lenses were obtained and packed in ice-cold saline and immediately taken to the laboratory. Each lens was weighed and its wet weight (mg) recorded. The lenses were homogenized with a Teflon rod and diluted to 1:10 (w/v) by adding 50mM potassium phosphate buffer (2mM EDTA), PH 7.00. The lens homogenates obtained were centrifuged at 10,000 rpm for 15 min at 4°C. The supernatants obtained following centrifugation were processed for estimation of the G6PD activity by Kornmethodberg and Horecker method . The 2ml blood sample was collected by venipuncture from the patients undergoing surgery for cataract on the same day. blood was collected in a EDTA bulb for the assessment of G6PD activity. All results were expressed in mean ± SD. One way Analysis of Variance (ANOVA) was used to test the significance of difference and student "t" test to test significance of difference between two groups. A pvalue < 0.05 was considered as statistically significant. Table 1 represents the comparisons of mean activities of Glucose-6- Phosphate dehydrogenase in RBCs and Lenses in deferent type of Cataracts. There was significant decrease (p<.001) in the activity of G6PD both in erythrocytes and lens in all cataractous groups when compared with controls. Lowest activity was observed in diabetic cataract group followed by nuclear cataract and cortical cataract. Table 1: Activities of Glucose 6 Phosphate dehydrogenase in RBCs and Lenses in deferent type of Cataracts. Oxidation of ESH(thiol) groups of Na+-K+ ATPase causes lenticular accumulation of Na+, ClÉ, Ca++ which leads to cellular hydration, Swelling, rupture and followed by opacity of lens . Orzaeisi et. al. were the first one who performed study on the association of G6PD deficiency and cataract in large population sample. They demonstrated that G6PD deficiency was significantly more prevalent in among the patient with cataract than in the general population . Similar results were observed in the study conducted in Sicily , India , Turkey . It has been suggested that decreased activity of G6PD in the lenses reduces glutathione activity, making the lens more susceptible to oxidative stress . The present observations suggest that reduced activity of G6PD may be one of the factor in development of senile as well as diabetic cataract. There are conflicting reports in the literature regarding the role of G6PD deficiency in the development of cataract. Various researchers suggested that in cataract high molecular weight proteins are formed following extensive oxidation which causes precipitation of lens proteins and thereby causing loss of transparency . The pathogenesis of the cataract in an early age individuals with G6PD deficiency might be shows that the enzyme plays an important role in the lens metabolism. Deficiency of G6PD affects HMP Shunt in the lens that leads to shortening of ribose availability for the synthesis of nucleic acid and decreases the renewal of lens proteins. Also decreases the synthesis of NADPH which is necessary to convert oxidized glutathione to reduced glutathione causes low levels of reduced glutathione. This might increased susceptibility of the lens to oxidative insult and subsequently leads to oxidation of lens proteins and precipitation of lens proteins loss of lens transparency [11-13] (Fig. 2). Figure 2: Schematic diagram showing mechanism of cataract formation and events in reduced activity of glucose 6 phosphate dehydrogenase. Katta AV, Suryakar AN, Katkam RV, Shaikh AK, Ghodake SR. Glycation of lens crystalline protein in the pathogenesis of various forms of cataract. Biomedical Research 2009; 20 (2): 119-121. Bunce GE, Kinoshita J, Horwitz J. Nutritional factors in cataract. Annu Rev Nutr 1990; 10: 233- 254. Zehra Hashim and Shamshad Zarina. Antioxidant markers in human senile and diabetic cataractous lenses. JCPSP 2006; 16 (10): 637-640. Halliwell B. Antioxidants: the basic what they are and how to evaluate them. Adv Pharmacol 1997; 38: 3-19. Marjorie FL Redox regulation in the lens. Prog Retin Eye Res 2003; 22; 657-82. Babizhayer MA, Deyer AL, Chemikov AV. Peroxide metabolizing system of crystalline lens. Biochem Biophys Acta 1992; 16: 1-9. Crabbe M, Goode D. Aldose reductase: a window to the treatment of diabetic complications? Prog Retin Eye Res 1998; 17: 313-383. Sun W, Zhang X, Zhang S, Zhou Z. oxidative damage and enzyme histochemistry changes in the senile cataract. U. S. Chinese Journal of Ophthalmology 2001; 1(1): 1-3. Orkide D, Yorulmaz EO, Pekel H, Suyugul N. Blood and lens lipid peroxidation and antioxidant status in normal individuals, senile and diabetic cataractous patients. Cur. Eye Res. 2002; 25(1): 9-16. Kornberg & Horecker. Determination of activity of Glucose 6-phosphate dehydrogenase by rate of reaction method. Method in Enzymology 1955; 1: 323-324. Meloni T, Karala J, Forteleoni G, et al. Glucose 6 phosphate dehydrogenase deficiency and cataract of patients in northern Sadinia. Am J Opthalmol 1990; 110: 661-4. Orzalesi N, Sorcinelli R, Guiso G. Incrased incidences of cataract im male subjects deficient in G6PD. Arch. Ophthalmol. 1981; 99: 69-70. Chandrasena LG, Silva LDR De, Silva KI De, Dissanayaka P, Peiris H. Change in Erythocyte Glucose 6 phosphate dehydrogenase deficiency (G6PD) and reduced glutathione (GSH) activities in development of senile and diabetic cataracts. Southast Asian J Trop Med Public Health 2008; 39 (4): 731-736. Moro F, Gorgone G, Li Volti S et. al. Glucose 6 phosphate dehydrogenase deficiency and incidences of cataract in Sicily. Ophthalmic Paediatr Genet. 1985; 5 (3): 197-200. Bhatia RP, Petel R, Dubey B. Senile cataract and Glucose 6 phosphate dehydrogenase deficiency in Indians. Trop Geogr Med. 1990; 42 (4): 349- 351. Yuregir G, Varinali I, Donma O. Glucose 6 phosphate dehydrogenase deficiency both in red blood cells and lenses of normal and cataractous native populations of Cukurova, the southern part of Turkey. Part I. Ophthalmic Res. 1989; 21(3): 155-157. Balaji M, Sasikala K. Sundararajulu G, Ravindran T, Sathar ML. Analysis of Glucose 6 phosphate dehydrogenase deficiency in anterior subcapsular and mixed cataractous lenses. Br J Ohthalmol. 1995; 79: 1124-1125.